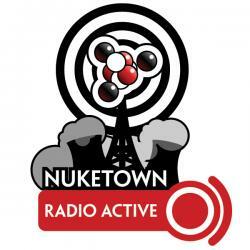 The podcast gets back up to speed after the holidays with news about what’s up with Nuketown, both on the site, and at home. There’s also speculation about the possibility of a geek workbench, and a review of the SciFiDig Podcast. Fun Christmas with StarGirl — it was the first year she was really able to get into it, and start to understand what was going on. She loved the geek tree and the “candy cane tree”. Got some cool stuff, including Iron Heroes (Conan-style d20 combat), Complete Adventurer, GURPs rule books, a “Life is Good” tire cover for the Wrangler, and a LEGO scout walker. And a seven port USB hub, which freaking ROCKS! Baby Nuke is doing well; Sue’s about 4.5 months along and feeling good but tired. If the math seems funky, well, take it from us (we’re experienced) the way they count things out, pregnancy actually ends up lasting something like 10 months. We have our first ultrasound this week. Had out first hospital tour this week; weird to be in a room with some very pregnant women and Sue barely showing (well, in comparison). By April at the latest, the gaming room goes away, becoming StarGirl’s room, which in turn becomes the baby’s room. Try cramming an entire room worth of stuff into half an office. So far going pretty well. I’m returning to some of my old, apartment ways, like storing my frequently used rule books in a milk crate that I can then haul up and downstairs. Some stuff, like the old 2E D&D books and misc. gaming rule books (like West End Star Wars) will be put into long term storage in the basement for that glorious day when the gaming room returns. I’ve been thinking of upgrading my work bench in the basement for a long time, and I have taken steps toward getting it organized. Now I’m thinking it could be a new geek space with the gaming room is going away. Place where geek electronics go to die. Place to store (and finally paint) my minis? Been talking about redesigning Nuketown for a while. Looking at moving the entire site over to the Drupal framework, which will allow me to much more easily publish blog posts, reviews, and podcasts (for example, it automates the entire RSS feed thing, both for stories AND for podcast). Could shave 15-20 minutes off Radio Active production time. Unified Theory of Nuketown: Comment on any story, use the same id to post to a forum, heck, I could even have contributors! Easily! Who could log in by themselves! And whom I could moderate! Test site should be up in a week or so; switch over will probably be a week after that. Not sure about how to handle archives. A podcast not unlike this one, though with more scifi (and more timely in general … a little less navel-gazing if you will). Listened to the most recent show while taking down my Christmas tree. That one was focused on a discussion of host Aaron Macom’s introduction of Narnia to his daughter (leading to an obsession with all things Narnia, which I’m hoping to replicate when Jordan is older) and a review of the special edition Sin City DVD.